"Tom, do you have Halloween in Ireland?" I had to laugh. Not only do the Irish celebrate Halloween - in fact Halloween has its very origins in ancient Irish lore and pagan practices. So, for my friend Jackie and all who love Halloween, below find a bit of a primer on this spooky holiday, its origins in Ireland, and how the Irish celebrate it today. Let's go back, shall we, before the Celtic Tiger, before Irish Independence. Back to the day of the ancient Celts approximately 2,000 years ago. In those days the peoples of the world hoped to explain the inexplicable with a variety of traditions. As the days turned darker, the ancient folk of Ireland had much to celebrate but also much to fear. They celebrated a good harvest knowing it meant survival during the winter months. But they also dreaded the long nights following Equinox when the division between day and night was at its thinnest. During this season of Samhain, dreaded spirits as well as the souls of the departed could pass through from the Netherworld into the present world threatening ancient Irish peoples with all sorts of mischief and mayhem. While the Irish invited the ghosts of their ancestors home to be honoured, they did what they could to ward off the evil ones, hoping their actions would protect them from harm. The ancient Irish donned costumes to confuse the spirits.They lit massive bonfires to light the darkness and cleanse the air from terrorising ghosts that populated the night. During the Festival of Samhain - the feast of the dead - malevolent spirits were appeased with gifts. Those who did not offer such sacrifice were sure to be visited with bad luck in the coming year. During this time of darkness, this close divisional boundary between the worlds of the dead and the living, and almost any boundary, was deemed dangerous. People avoided crossroads and even the boundaries to their neighbour's land. During this time, devilish magic was also at hand. Should an Irishman visit a graveyard and walk three times around a plot they may be given a vision of the future but risk being captured by the Dark Spirit. Similarly, a woman looking in a mirror might see the man she would eventually marry but could also be caught up in the claws of darkness. With the rise of Catholicism in Ireland, the Church - hoping to absorb pagan traditions - made this period of Samhain its own. Today, All Hallows Day (now known as All Saints Day) is celebrated on November 1st. All Souls Day closely follows on November 2nd. Both days honour the dead - a reflection of ancient times. Fortunately, many of the traditions and customs of the Festival of Samhain have been incorporated into the contemporary version of Halloween which many enjoy to this day. Today many of the ancient traditions of Samhain are still practiced in Ireland (and around the world) though few know it. "Trick or Treat" is a modern derivative of the ancient Irish practice of warding off dark spirits with the benefit of gifts. 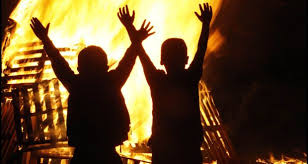 Bonfires are still lit throughout Ireland though today this is usually part of general merriment rather than an attempt to clear the skies of unwanted ghosts. 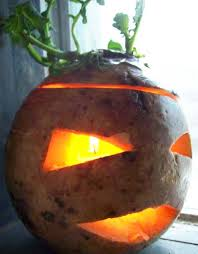 Yes, the Irish today carve pumpkins though in times recently passed they carved turnips into Jack-o'-Lanters (try it - it's almost impossible due to the dense texture of the turnip but most Irish households did so nonetheless. Pumpkins simply were not available in Ireland until recent times). On Halloween night, kids rush through Irish cities, towns and villages, collecting treats from friends and neighbours. Today they wear expensive costumes, much as they do State-side, though when I moved here most people dressed their kids in black bin-bags which had the benefit of being much less expensive but just as fun. Throughout the day some people try to avoid walking on sidewalk cracks (much as they avoided 'divisions' such as land boundaries in the old days), fearing bad luck. Children will attend Halloween parties. There they will revel in ghost stories and duck for apples. A Halloween Brack (a dense cake) will be served. Hidden within are a variety of treasures.The lucky one who finds a coin will have a year's good luck. If you find a ring then marriage is imminent! And at midnight, a few brave and hardy souls will foolishly venture to the graveyard in hopes of welcoming home the ghosts of their dear ancestors while doing all they can to avoid Satan himself. So to answer Jackie's question: Yes, Jackie, we have Halloween in Ireland. In fact, your love of this season - this dark division between night and day, and good and evil - is due to the practice of long ago Celts. As it turns out, if it hadn't been for the Irish there would be no Halloween at all. A Survivor's Guide to Living in Ireland 2017 Kindle Edition Now Available! Loan offer amount 5,000 to 10,000,000 apply now.